Shalom and greetings in this New Year in the name of our Lord, Yeshua HaMaschiach, Jesus the Messiah. Although the past three years have been challenging, I praise God for His goodness and faithfulness and look forward, once again, to His tender mercies in the year 2019. I also praise God for each of you. It is a privilege to serve as your “arm of extension” into the Jewish community. My appreciation is beyond words for your loyalty and support, both in prayer and financial giving, as the Lord continues to teach me how to fly solo. May God bless you as you have blessed me and His Chosen People (Gen. 12:1-3). As I look back on the year 2018, my heart is full of thankfulness and praise to God for His goodness and faithfulness in both my ministry and personal life. I have seen God’s faithfulness as we share the Gospel message with “the lost sheep of the house of Israel” and enlighten believers to the Jewish roots of Christianity. He has blessed our outreach to the Jewish community through our Messianic fellowship, Tikvah BaMidbar (Hope in the Desert), and blessed our Annual Citywide Messianic Passover Seder. Please pray that the Good News many heard for the first time would bear fruit, and for the spiritual growth of the new believers in the Lord. So then faith comes by hearing, and hearing by the word of God (Romans 10:17). In my ministry update letter last summer, I wrote about a worker I hired to repair my rain-damaged ceilings. In the course of our conversation, while answering his questions about my ministry, he told me that he, too, was a born-again believer and asked to see a photo of my late husband. CJFM sounded familiar to him and he remembered a Jewish missionary who spoke at his former church about 17 years ago and, because of his message, was now witnessing to the Jewish couple who lived next door. Upon viewing Barry’s photo, he said, “That’s the guy!” Well, this worker, “S,” is back to do some interior painting and shared with me that just before Christmas, the wife of this Jewish couple who has been attending church with him and his wife had prayed to receive the Lord. He said “M” actually walked down the aisle in response to the altar call. She also sent them a meaningful Christmas card and will be attending Bible study with his wife. Thank God for answered prayer, and thank you for praying. When I asked about her husband, “S” said, “He’s more open now and I believe it will only be a matter of time as we continue our discussions.” I invited “S” and his wife and their Jewish neighbors to our Annual Citywide Messianic Passover Seder on April 12, 2019, at the Orange Tree Golf Resort in Scottsdale. If you happen to be in the area, please join us. Call 602-494-1243 or visit hopeinthedesert.org for details. Please pray for the Lord to prepare hearts and that every person who attends the Passover Seder will be blessed—Jew and Gentile alike. “So shall My word be that goes forth from My mouth; it shall not return to me void” (Isaiah 55:11a). I am a fan of the arts and have met many Jewish individuals while attending various events, and have had numerous opportunities to share with them, PTL! The most unusual meeting was at a symphony concert held at a local church. A woman sitting in front of me became ill and fainted. The couple who was sitting next to her came and sat in the two vacant seats next to me. While waiting for the paramedics to arrive, we began talking. This husband and wife, who have been married 60 years, are Jewish and were born in Moscow, but are snowbird visitors from Canada. (My late mother-in-law was born in Minsk, to which they responded warmly.) Since religious observance was forbidden in Russia, they knew nothing about the Bible and were still hesitant to discuss spiritual matters, especially Yeshua (Jesus). “We were never allowed to practice any religion,” they said. I responded, “But you’ve been living in a country for 40 years that recognizes religious freedom. Have you not thought about God?” Avoiding the question, “Rachel” told me that her husband, “Morey,” was a poet and had recently written his second book of poetry. So I asked Morey who did he think was the greatest poet. As he was contemplating his answer, I said, “King David. That’s why you should read the Psalms!” I also challenged them to read the New Testament, beginning in the Book of John. It was no coincidence that I saw them again at another event, and we embraced and chatted again. This time, they said, “Yes! We will read the Bible!” May this dear couple have eyes to see and ears to hear! I don’t think this is the end of our encounters. I will be attending an opera next month. 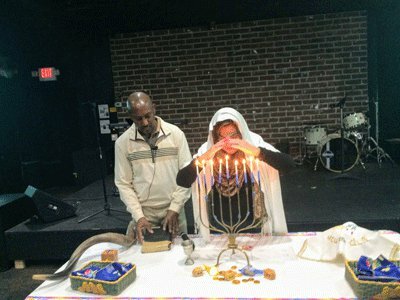 It is always a blessing to celebrate Chanukah at Tikvah BaMidbar. We teach the similarities between Chanukah and Christmas, the main one being that the central theme for both focuses on their respective miracles and the fulfillment of prophecy. It’s also a time of the year that magnifies the truth that our God is the God of His Word! Chanukah, the “Feast of Dedication,” also known as the “Feast of Lights,” marks the occasion when the Jewish Temple was rededicated after the Greeks had desecrated it. Daniel asked, “How long will the vision be, concerning the daily sacrifices and the transgression of desolation, the giving of both the sanctuary and the host to be trampled underfoot?” And he said to me, “For two thousand three hundred days; then the sanctuary shall be cleansed” (Daniel 8:13b-14). The transgression that Daniel is referring to begins with Antiochus Epiphanes, the Hellenized ruler of Syria, a vile man who hated the God of Israel and considered Him a lesser god. He invaded the Holy Temple of God and carried away the golden altar, candlesticks, vessels and other sacred treasure. And to show his hatred and contempt for God—he slaughtered and boiled a pig and poured its broth upon the Holy Scrolls of the Law. True worship was stopped, and was replaced by pagan worship in the Temple. He then continued the Abomination of Desolation by erecting a statue of his god Jupiter, which was placed in the Temple. Epiphanes began his persecution of the Jewish people in 171 BC, and it was exactly 2,300 mornings and 2,300 evenings on the 25th of Kislev (our December) that the Temple was cleansed and rededicated. Our God is, indeed, the God of His Word!